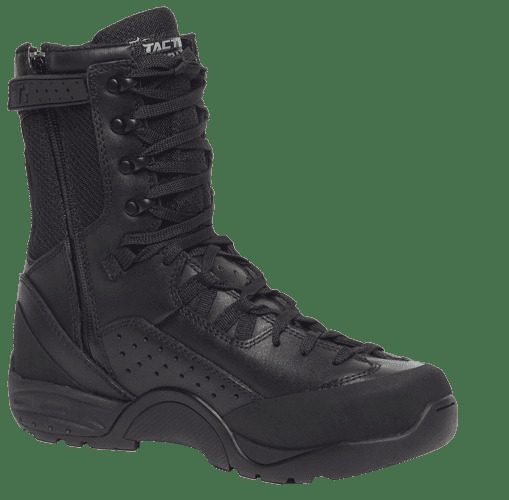 The Tactical Research Men's QRF ALPHA B9Z1 Hot Weather Side Zipper Assault Boot w Polishable Toe is ideal for security professionals looking for a lightweight duty boot they can depend on. 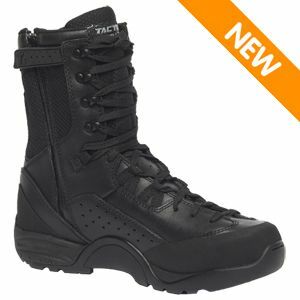 This boot has a polishable toe and is 8 inches in standard military height for maximum ankle support and protection and features 100% non-metallic construction. Hot weather construction promotes breathability to keep your feet dry and cool all day long. Designed to address the infil & exfil operations of a Quick Reaction Force (QRF) team in mind, The QRF Series of boots offer a unique and purposeful option for when movement is essential. A convenient side zipper makes wear and removal effortless for those on the go. With design and performance influences from the outdoor trekking and approach shoe category, the QRF Series integrates an aggressive, lace-to-toe closure system, a medial side rappelling overlay and low profile soling system to enhance performance in multiple environments. An exclusive long-wearing RAKKASAN outsole ensures excellent traction on wet or oily surfaces.